Home security surveillance cameras are a good way to protect your home and family from security threats. High quality security installations don’t have to cost a fortune. There are many affordable surveillance camera systems available. No matter where you live, there is always the possibility that you can become a victim of crime. There are a few things to consider when you develop a new home security plan. It’s important to look at your home in the way a burglar would see it. Consider the items a burglar wants to steal. These items would include anything that can be sold for quick cash at a pawn shop or on the black market. Decide how many security cameras it will take to protect the outside of your home. 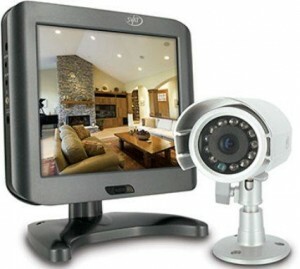 Average home security surveillance cameras can accommodate up to 15 cameras. Installing the cameras where they can be seen is a good crime deterrent. A potential burglar will see the cameras and possibly choose another target. Home security cameras ave available at a reasonable cost. Higher priced models will provide more advanced features. You’ll find cameras that can send a video image to your cellphone or computer. The average cost for an outdoor home surveillance system can be found for under $1,000. It will depend on the type of security equipment you choose. Consider speaking with a home security professional to choose the right equipment for your home. If you buy your own surveillance camera system, you can pay a security company to monitor your home. These systems are easy to install, and with the increase in technology advances, you will be able to monitor your cameras from your cellphone or home computer. There are other uses for home security cameras, such as keeping an eye on your older kids while you are at work. You can also use hidden cams to monitor a babysitter who is watching your kids. This is a popular way to check on your household at any time of the day. To choose the right home surveillance system, you have to decide between a wired or wireless system. Choose the number and locations of your security cameras. Determine your budget before you choose a security system. Black and white cameras are cheaper than cameras that produce images in color. Home security cameras have been popular as early as the 1970s. Some circuit breakers used to be located on the side of the home. This made it easy for a burglar to disconnect the system. Some systems were hooked up through the telephone line. The burglar could simply cut the telephone line. Today, home security systems have improved. Wired camera systems have a standard backup power source. It’s no longer possible for a burglar to easily disconnect a security system. The power source is strong enough to power the security system for days. A complete home security system includes adding several layers of security to your security plan. It takes more than an alarm system to develop a secure security plan. The more layers of security you add to your home, the more protection you will receive. Consider other areas of your home, such as doors and windows. Doors and windows need to be protected with sensors. Sensors will detect movement or glass breakage. An audible alarm will sound if these areas are compromised. Motion detectors do a great job of sensing movement in either a room or outdoors. Burglars don’t like to make a lot of noise. If they try to break in through the windows or doors, the loud audible alarm will likely send them away. Motion detector sensors are so advanced that they can distinguish between a pet or a person. They can be adjusted to pick up movement according to weight. Department stores use the same technology to be sure everyone has cleared the building at closing time. There are so many security equipment to choose from, that the decisions can be overwhelming. Consider calling a local home security company to visit your home for a security survey. You can decide to buy or rent your home security equipment. You can use a home alarm company to monitor your system, or you can monitor it on your own. Some home security systems are so advanced that they include voice recognition technology. This technology allows you to verbally give your alarm system commands. You’ll also find new fingerprint technology for your home’s gates and doors. The wide range of choices available to you is only limited by your budget. Almost all modern alarm systems include fire detection sensors to alert your family of the presence of smoke and fire. You can add carbon monoxide detectors to alert your family of the presence of this deadly odorless gas. When a home is burglarized, most families feel victimized. There is no guarantee that all security methods will work completely, but developing a home security plan will reduce your chances of being a victim. The best thing about hiring a security alarm company to monitor your system, is the fact that emergency help can be summoned quickly. It will be hard for you to monitor your home while you are at work. If you decide to rent your security equipment, the installation will be taken care of for you. The only thing you will have to do is decide what type of equipment you want. Most home security companies will have door and window sensors available. They will also have the capability to include motion detecting equipment in the rooms of your home. These upgrades don’t cost very much to add to your basic home security package. An average alarm system will include a keypad that controls the security system. This is where you have the ability to arm or disarm your system. They also include a panic button, and you can add a medical alert if you need to. These panic and medical alerts can be routed to your local emergency department. If you’re wanting to buy a used home security system, some alarm companies offer used systems for sale. 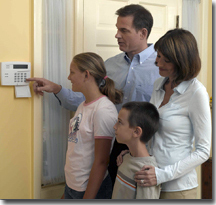 A home alarm system will give your family peace of mind. You have to turn the alarm on even when you’re at home for it to be effective. You would be surprised at how many busy families forget to turn the security system on when they leave. Burglars are always looking for good opportunities. They often watch a home for a few days before they decide to break in. If you have a lot of family members coming and going from the home, they know that often the security system won’t be turned on. You also need to have the alarm system monitored. A burglar often spends less than ten minutes inside a home before he leaves. If the system isn’t monitored, the burglar could be in and out before being detected. Some communities require a home security alarm permit. Check with your city about their rules and regulations regarding home alarms. You’ll also find some police departments allow the security system to be set up straight to the police. Search your city’s website to discover more information about your city’s home alarm system monitoring requirements. Choose the home security system that meets your family’s needs. Wired security systems must be wired inside your home with cables. This will take drilling holes into your walls and ceiling. These types of systems are lower in cost than wireless systems. You could eventually spend more on maintenance cost for a wired system. The wired system’s transmission signals are often stronger than a wireless system. A wireless system must be set up in a location where the signal is the strongest. The advantage of a wireless system is the fact that installation is much faster and easier. The initial investment is greater, but the overall maintenance cost will be down. Most wireless home security systems can be set up to work on a Wi-Fi network. This makes monitoring your system as easy as logging onto your computer or smartphone. You can check on your home from anywhere in the world. Besides choosing an alarm system, you should upgrade the level of security around the outside of your home. Walk through your yard and look for ways a typical burglar could break into your home. Check the doors, windows and gates. The garage should also be inspected as a potential security threat. The garage door should have a locking mechanism installed on the tracks. When locked, this will prevent the opening of the garage door. The garage door that allows entry into your home should be made of solid steel or wood. Most homes have a hollow door, and that makes kicking the door in an easy matter. You should install deadbolts on all doors that lead into your home. Be sure the deadbolt has at least a one-inch throw. Join a neighborhood crime watch in your area. This is the best way to prevent crime from entering your neighborhood. Joining forces with your neighbors will help you get to know everyone in your community. Become familiar with who belongs in your neighborhood and who doesn’t. Most burglars will park away from the intended target and walk to the home they want to burglarize. If you or your neighbors see suspicious vehicles or people in the neighborhood, the police should be called. It is always better to be safe than sorry. Find out if your local law enforcement has a crime-watch program. Most city police departments have a program of crime education for their citizens. Have the police educate you and your neighbors about the best practices for protecting your home. They also will be familiar with crime patterns in your area. Community awareness is important to help prevent crime. When you go on vacation, you should have one of your neighbors pick up your mail and newspapers. Ask them to open your drapes and make your home look like someone is there. They could even park an extra car in your driveway. Install timers for indoor and outdoor lights. Timers are an inexpensive way to make your home look occupied. Be sure your home has adequate outdoor lighting at night. Solar lights are a very inexpensive way to illuminate your home. They also look beautiful and won’t cost you money on your energy bills. Talk about your home security plan with all family members. Let them know how important it is to lock the doors and windows. Teach them to use the alarm system even when they are at home. Make sure they know what to do if the alarm goes off. Develop a fire safety plan and make sure everyone has a meeting place outside of the home. Each person should know the best fire evacuation route in your home. Practice having fire safety drills and your family will be prepared. Preparation is one of the most important aspects of home security. You want to make your home a very difficult target for a burglar. A burglar wants to be able to enter your home with ease and without noise. Door and window alarms are an important part of the security plan. Driveway alarms and outdoor motion detectors are gaining in popularity. They are useful because they detect movement in the yard and driveway. If your busy inside your home, you may not be aware that someone has arrived. Be sure all entry doors have a peephole installed. Teach your children not to open the door for strangers. The entry doors into your home should have quality locks on top of having good deadbolts. The deadbolt’s throw should be secure enough to withstand several kicks to the door. You would be surprised to know how easy it is to kick the average door open. The backdoor is a favorite place for a burglar to break in. If you have a private fence, then once they are inside, they are hard to be detected. Follow these tips to reduce your chances of a home burglary. Contact Techpro Security today for a home security system quote.